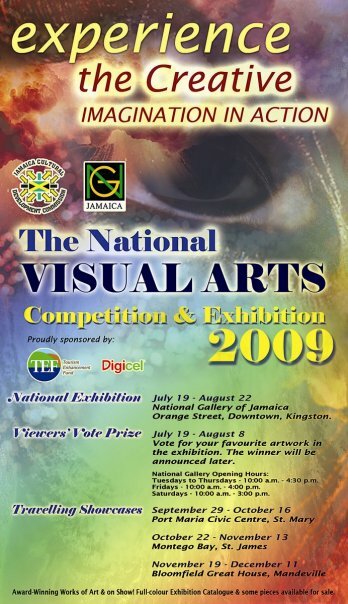 The 2009 National Visual Arts Exhibition and Competition opens at the National Gallery on Sunday, July 19, 2009 at 3 pm, when the winners of the medals and other awards will also be announced. This exhibition and competition, popularly known as the Festival Exhibition, has been held annually in Jamaica since 1963 as part of the Independence Festival and has played an important role in the development of post-Independence art, especially the unearthing of new talent. Since 2007, the exhibition has been hosted at the National Gallery, as a collaboration with the Jamaica Cultural Development Commission, the organizers of Festival. The exhibition has adult and youth sections, each of which are selected from the submitted entries by an annually appointed jury. The exhibition continues until August 22. The entrance fee to the National Gallery has been waived for the period and it is also an opportunity to see the permanent collections and the Selections from the Aaron and Marjorie Matalon exhibition free of cost. See National Gallery facebook group for directions and more information on the National Gallery.